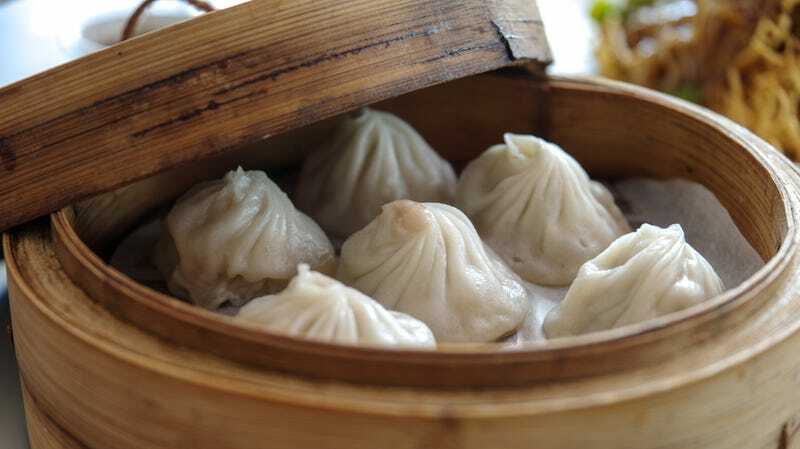 Xiao long bao, the broth-filled Shanghainese steamed pork dumplings, is inarguably one of the great culinary inventions of mankind. When done right it can induce eyes to roll to the back of your skull and involuntary noises from deep within your soul. When I give walking food tours of Chicago’s Chinatown, one of our first stops is always to a restaurant that serves xiao long baos. My favorite part is watching the look on neophytes’ faces when, upon biting in, the dumpling bursts inside their mouth, and the rich, warm broth washes over their palate. Their reactions come in threes: Eyes bulge, laughter, and a slurred “Ohmigod” with hands covering their full mouths. The following, in five steps, is everything I know about the art of eating xiao long bao. I ask you to give it a shot. Treat xiao long baos with the respect it deserves and it will pay many dividends. 1. The xiao long bao will be piping hot as it arrives to your table in a bamboo steamer. Now comes the tricky calculus: You don’t want to pop the dumplings in your mouth right away because it’ll scald you like a mother. On the other hand, the longer it cools, the gummier the underside dough will develop, which increases the odds of the dumplings tearing and spilling out its liquid gold. (Some restaurants will steam with a piece of lettuce or parchment paper beneath the dumplings, which makes removal from the steamer basket easier.) The way around this, at least for your first few dumplings, is to quickly remove from steamer and let cool on your soup spoon. 2. Your soup spoon will be every bit as important as chopsticks when eating xiao long baos. There will be a accompanying bowl of dark vinegar (and if not, demand it). Don’t tempt fate by dipping the dumplings into this shared bowl. Instead, scoop about 1/4 teaspoon of vinegar into your soup spoon. If there are matchsticks of ginger present, you might want to consider adding a piece onto the spoon, too. You’ll be carefully transferring the dumpling onto this vinegar-dabbed soup spoon instead. 3. Proper xiao long bao will be crowned with a ring-shaped dough skin atop the dumpling. This is important for practical, aesthetic, and culinary reasons. This ring is created by crimping the dumpling’s edges until it seals. Ideally, you want to have about a dozen of these crimps, spaced evenly, and pronounced. “What’s the big deal,” you might think. Well, this doesn’t improve the taste experience, but if the crimps and ring are present, it’s a decent sign the cooks who made these dumplings give a damn and know what they’re doing. For practical reasons, however, this ring is important because it’s the best place on the dumpling to pick up with chopsticks without tearing the dough skin. (Never pick it up from the middle.) Pick it up firmly and confidently with chopstick ends clasped onto the ring. The bottom should sag (this is broth + gravity). Quickly slide your vinegar’d soup spoon underneath the dumpling. Transfer the dumpling-on-spoon back to your bowl. 4. If your xiao long baos are hot from the steamer, it may take up 3-4 minutes for the dumplings to be cool enough to consume in one bite without burning the inside of your mouth. However, those who can’t wait might consider this hack: Near the top of the dumpling, just to the side of the dough ring, use your front teeth to nibble off a piece of the dumpling skin. You’re essentially creating a release valve for the steamed interior, which should speed up the cooling of your dumpling. There are those who advocate puncturing the dough skin and allowing the interior juices to spill onto the spoon. I believe this takes away its greatest tactile joy: the inner-mouth detonation of broth which takes place in step five. 5. Now it’s time to consume. Your dumpling is not scalding hot, it’s not cold, it’s in that Goldilocks zone. Treat this as you would an oyster shooter. Eat this in one slurp. Allow the dumpling and vinegar to slide from spoon into your mouth. Close your lips tight. Bite in, and allow the interior soup to burst and wash over your palate. Savor this rich broth. Marvel at the interplay of savory pork and sweet vinegar bite. This, friends, is among the top five food experiences our world has to offer.